This resource brief provides a selection of current, high-quality resources about substance use disorders and their public health impact. 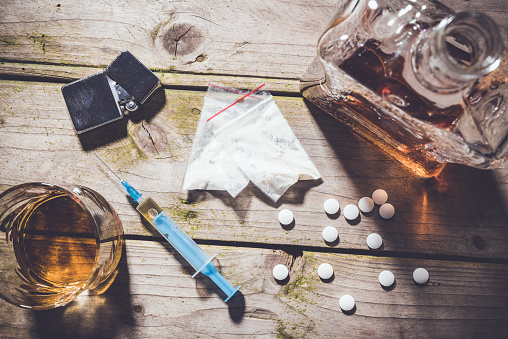 Resources relate to alcohol, cannabis (marijuana), stimulants, hallucinogen, and opioid disorders; these resources are chosen from NCA partners based on utility for use by community health centers. Substance use disorders, as classified by the Diagnostic and Statistical Manual of Mental Disorders, Fifth Edition (DSM-5), “occur when the recurrent use of alcohol and/or drugs causes clinically and functionally significant impairment, such as health problems, disability, and failure to meet major responsibilities at work, school, or home.”1 The Substance Abuse and Mental Health Services Administration (SAMHSA), maintains a publications and resources portal that contains evidence-based and best practices, information on co-occurring disorders, national strategies and initiatives, access to national resources, and information on how to request technical assistance from a network of federally-supported centers. Annotation: Health centers and supportive housing providers are exploring practical approaches and funding strategies to address the impact of the Opioid Crisis on homeless and vulnerable populations. Audience: Clinicians. Developed by: Corporation for Supportive Housing (CSH). See other resources developed by CSH. These resources have been developed by our partners and serve as an introduction to the topic. Annotation: An infographic showing how health centers have responded ot rising demand for substance use disorder (SUD)treatment and counseling during the ongoing opioid crisis. In addition to opioids and other SUDS, the infographic shows changes in other behavioral health services at health centers, including for alcohol dependence and tobacco cessation. Audience: n.a. Developed by: National Association of Community Health Centers (NACHC). See other resources developed by NACHC. The clearinghouse actively collects focused resources on this topic. You can view all resources within the clearinghouse related to substance use disorders here. 1. Substance Abuse and Mental Health Services Administration. Substance Use Disorders.